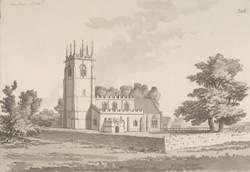 All Saints' church in the village and parish of Hawton is situated two miles south of Newark in Nottinghamshire. The church has a particularly fine chancel, built by Robert de Compton in the 14th century. The church tower dates from 1482. The building was restored in 1880-1887 by Hodson Fowler.